Blogs have become essential parts of any business’ website. They provide a channel for you to publish fresh, original content that keeps your website in the search engines’ and your customers’ good graces. Designing a blog isn’t just about making it look good – it’s about making it easier for visitors to read and share your content. Let’s review the four of the essential parts of a blog and discuss how we can use them to make onpage blog better for your readers. Don’t treat your blog’s homepage as if it’s the first thing all your visitors will see. This may be true for your regular readers who’ve already bookmarked your blog in their browser, but people looking through RSS or social feeds are more likely to land on individual article pages. They might not even see your homepage unless they click on your Home button or banner. 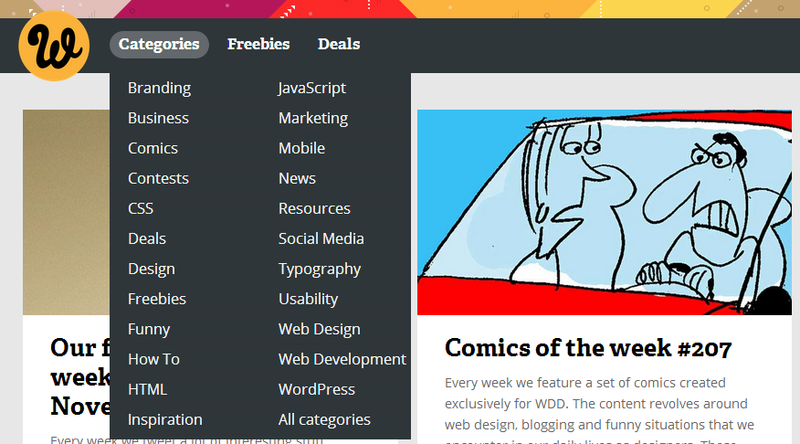 If that’s the case, displaying full blog posts is hardly the best idea for your homepage. Keep it simple by focusing on offering excerpts of your most recent or most popular posts, coupled with eye-catching visuals. 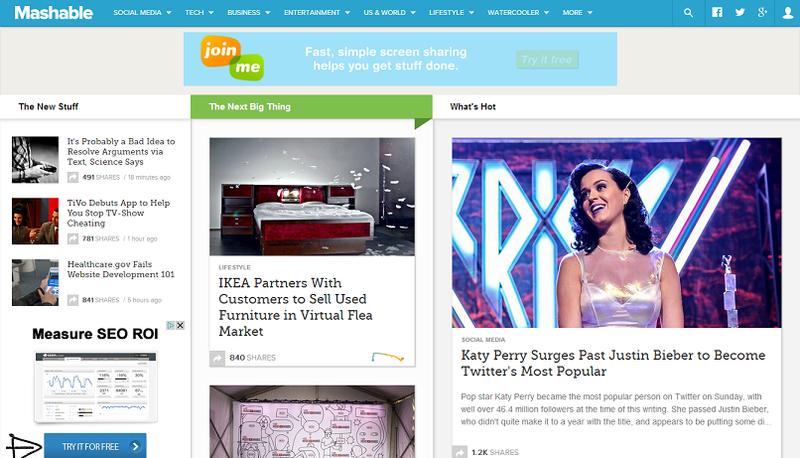 Mashable’s homepage, for example, displays nothing more than lists and excerpts of featured, new, and popular articles, along with visual thumbnails and quick navigation options. One of the most common problems I see in blog sidebars is clutter. Cramming too much content into your sidebar can distract readers from your actual articles, and might even make your sidebar longer than your individual articles. You don’t have to get rid of your sidebars altogether, but remember that they’re meant to help users navigate through your site or perform actions quickly. Don’t clutter it with 3 years worth of archive links or unnecessary widgets, and try to avoid using more than one sidebar in your layout. 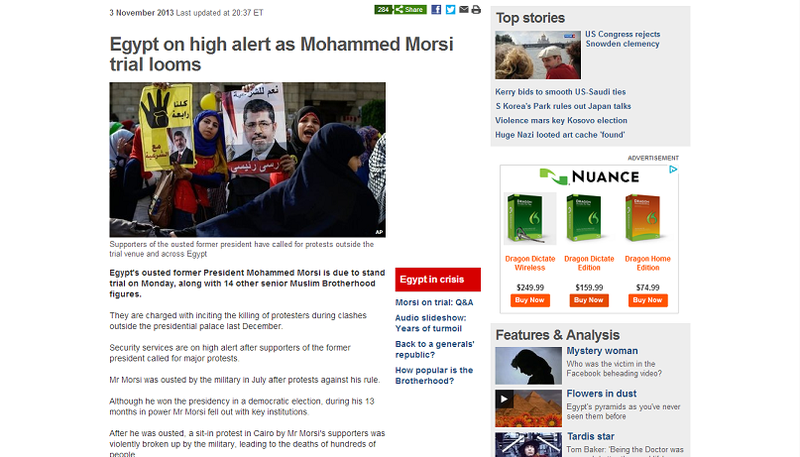 BBC.co.uk keeps its sidebars for the homepage and individual article simple by only displaying links to relevant articles or to the latest articles, along with a couple of ads. We’ve kept our own sidebar clean and simple by only including a contact form, a list of authors, a few social media widgets, links to popular articles, drop-down category and archive menus, and banners of associations we’re a part of. Visitors coming from social media sites or RSS feeds are more likely to land on individual article pages instead of your homepage. You need to make sure all the important navigation elements are easily accessible on this page. It’s also a good idea to display a list of posts related to the one your visitors are currently reading – this encourages them to explore a little more and discover your other content. 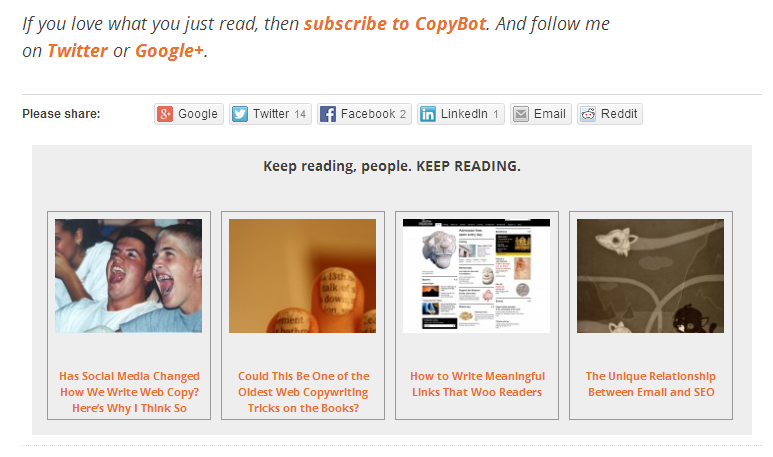 The Copybot displays related articles at the bottom of each individual post, and has a quirky call to action to get people to “keep reading”. It’s also important to include social sharing buttons on each page to make it easier for readers to share your content on the social networks of their choice. The way you organize and categorize your blog is another important aspect of blog design. While they aren’t exactly issues a graphic designer should worry about, how you categorize your articles can significantly affect your blog’s navigation. Web Designer Depot uses really specific categories based on their topics and what their audience expects to find on their website. Their top navigation bar is accessible on all their pages too, and this makes it easier for users to explore the rest of their blog. Being familiar with these four basic elements can help you develop a more user-friendly layout and design for your blog. If you need a professional web design company to design or redesign your blog for you, contact us today.